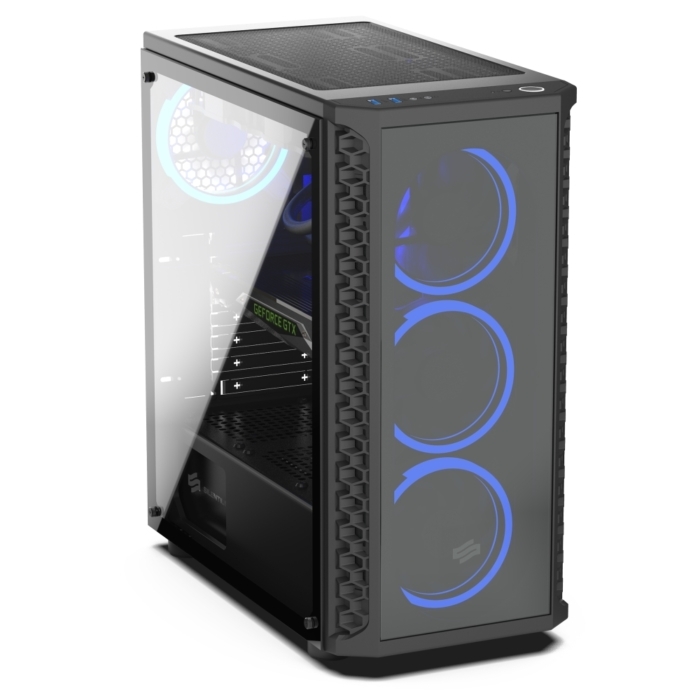 Signum SG1X TG RGB New! 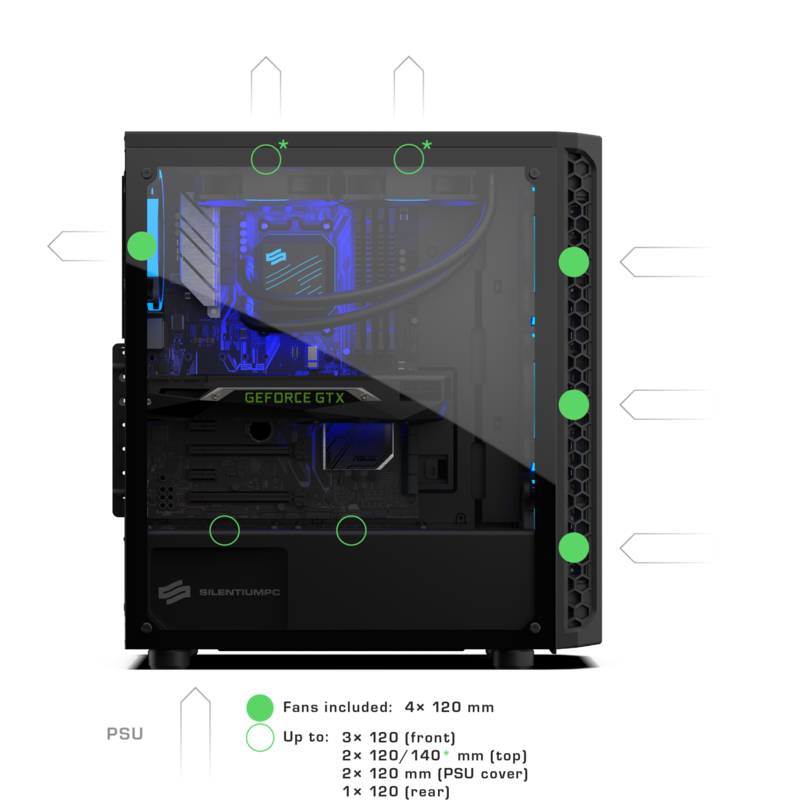 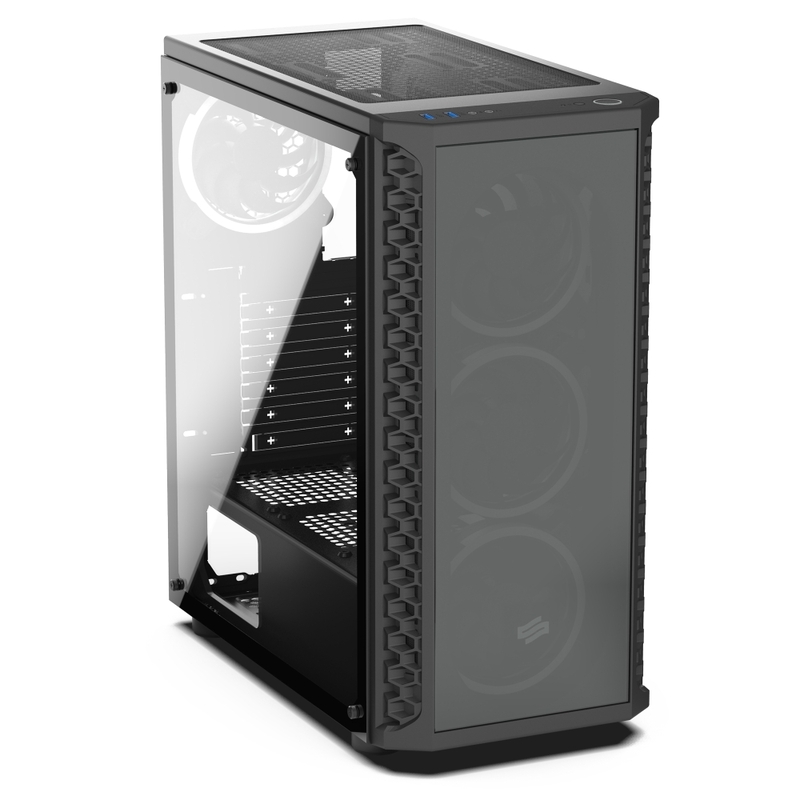 Two tempered glass panels covering the Signum SG1X TG RGB case are a response to the expectations of users who are particularly interested in the exposure of an aesthetically built and powerful computer. 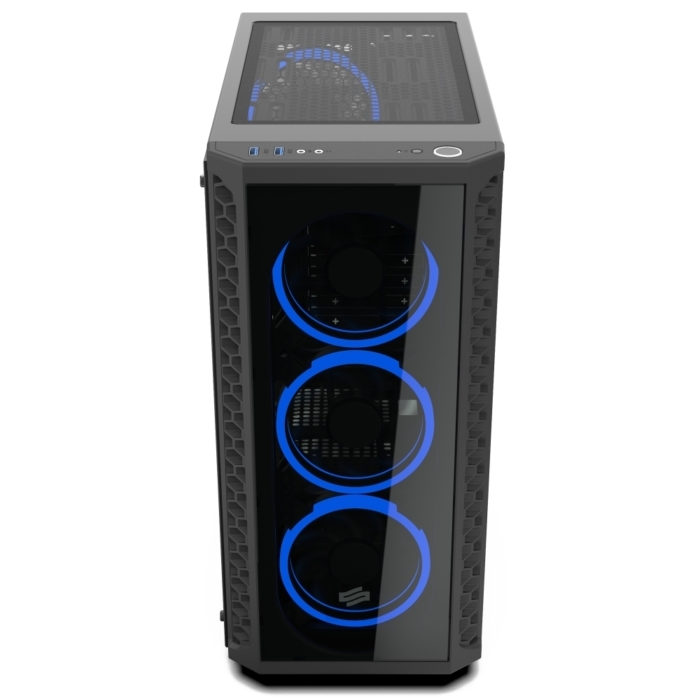 Behind the front panel there are three (out of four) Sigma HP Corona RGB 120 mm fans which enlighten the whole computer set. Signum SG1X TG RGB joins the SilentiumPC Signum SG1 series as a flagship model equipped with two tempered glass panels and four Sigma HP Corona RGB 120 mm fans. 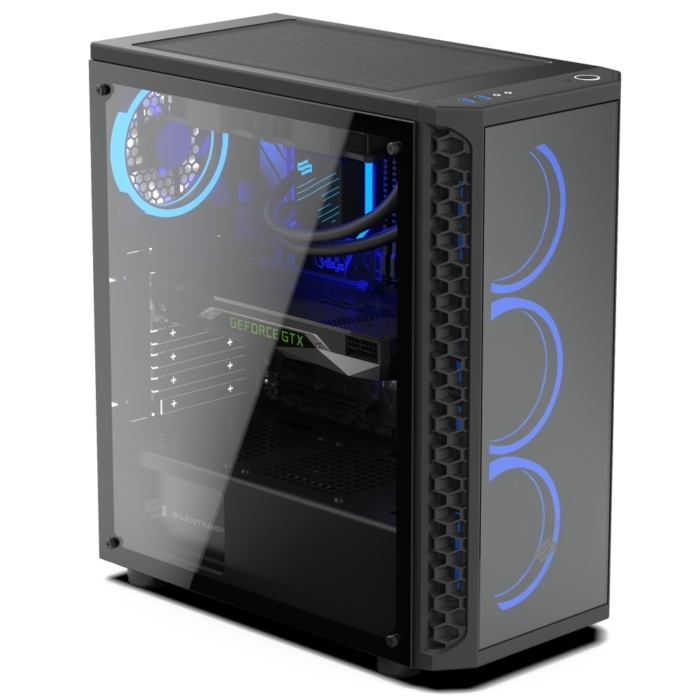 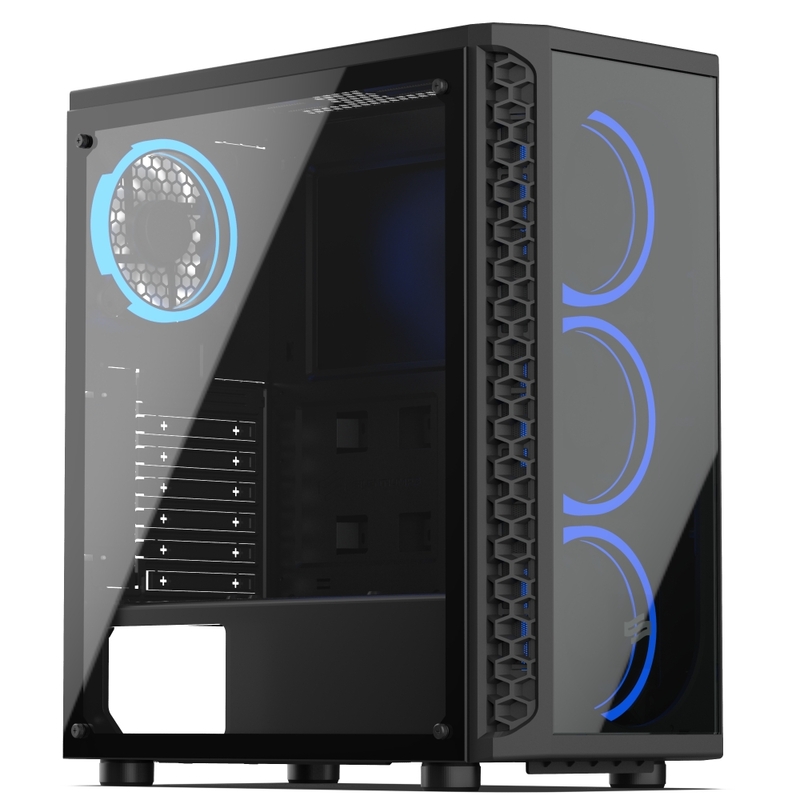 It is a reasonably priced offer for users who want to build an aesthetically looking computer with the impressive and configurable RGB lighting. 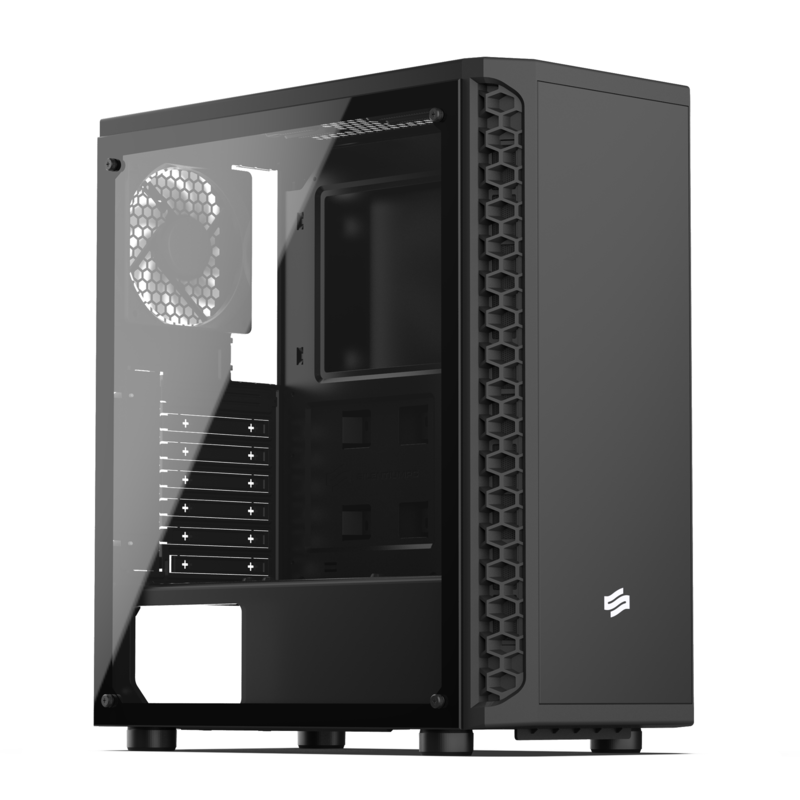 What distincts an SG1 family is a surprisingly large spaciousness, versatility and a compact design, but also very good ventilation for which i.a. the hexagonal front takes care, specially designed montage platform i.a. 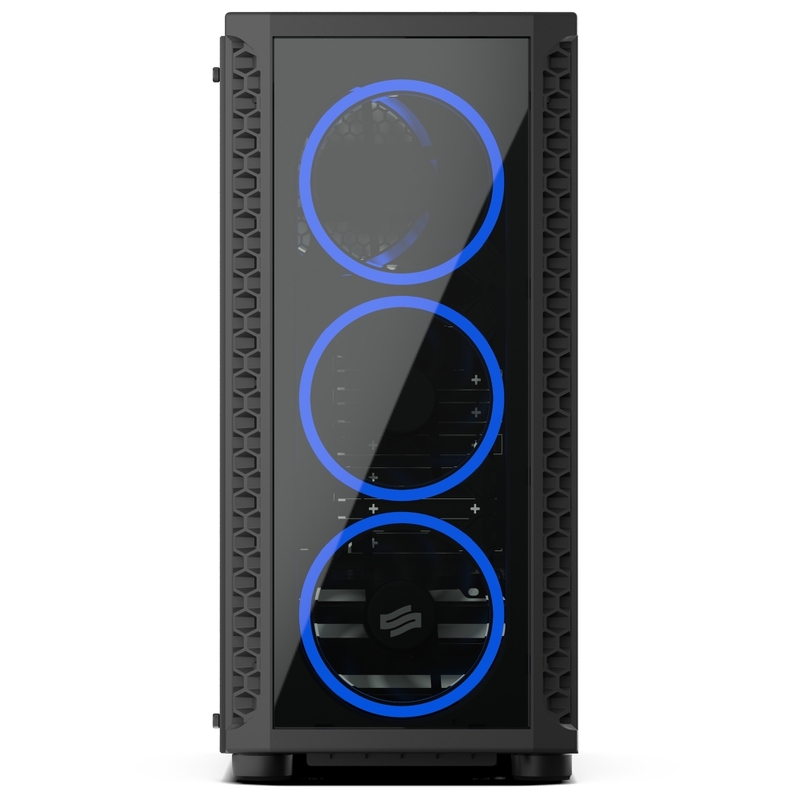 for the motherboard, and in the end – four Sigma HP Corona RGB 120 mm fans. SilentiumPC Signum SG1X TG RGB is an answer to the expectations of users when it comes to making computer sets visually attractive. 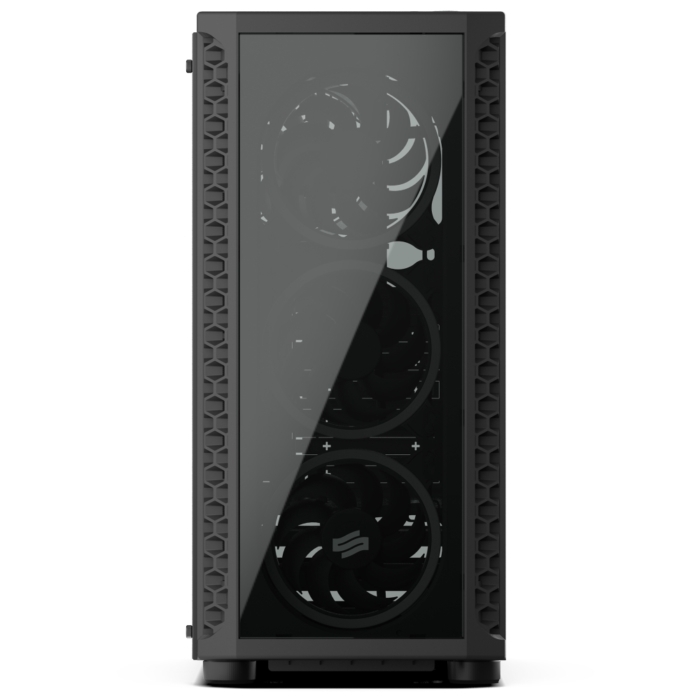 What accomplishes this task are two tempered glass panels – side and front, but also a set of four Sigma HP Corona RGB 120 mm fans with high static pressure and a glowing ring. They are perfectly visible through the glass panels and proudly illuminating a tastefully composed computer’s interior. 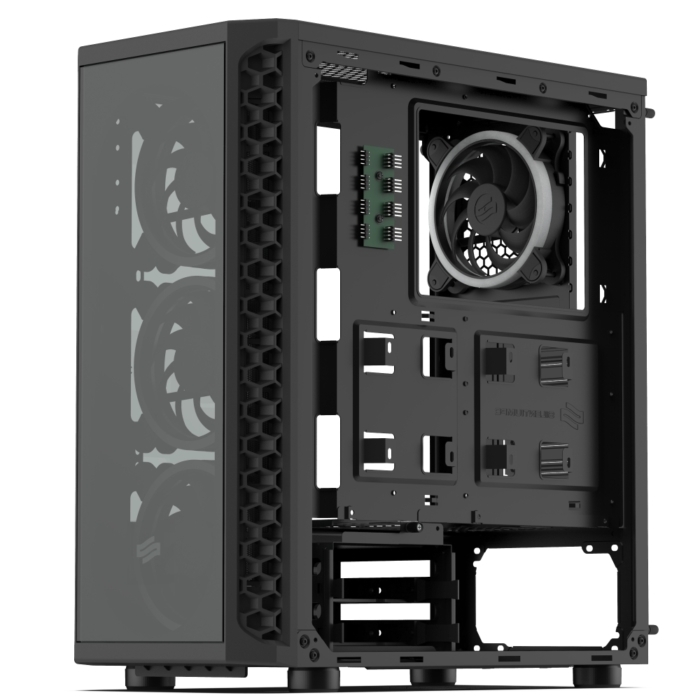 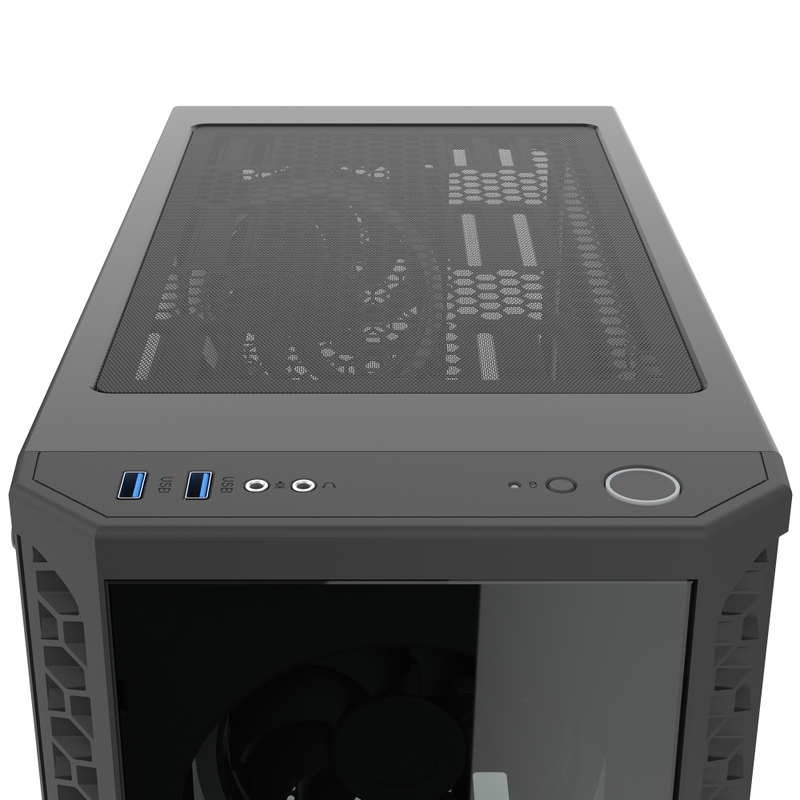 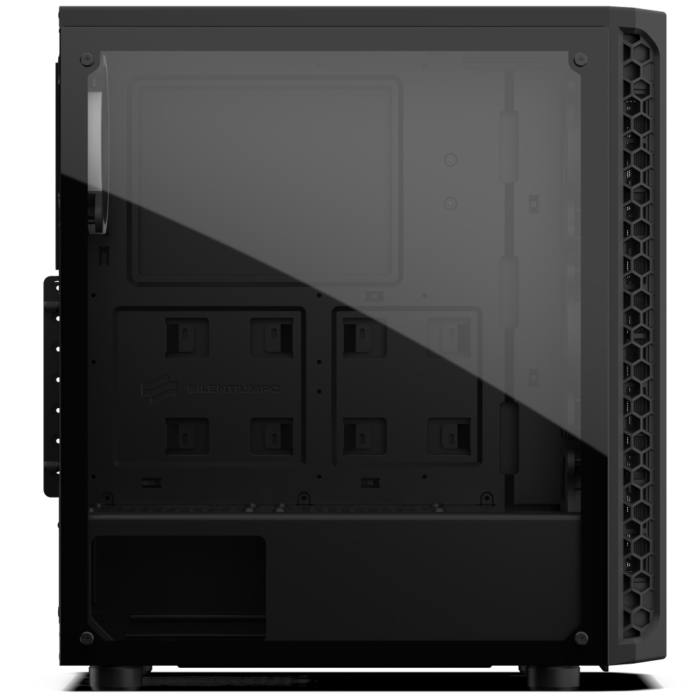 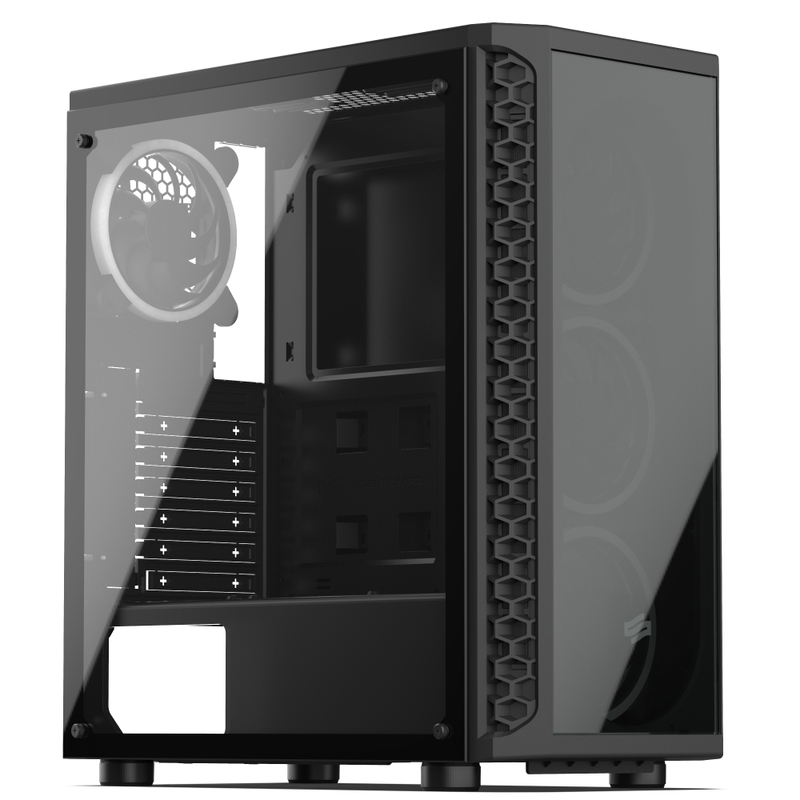 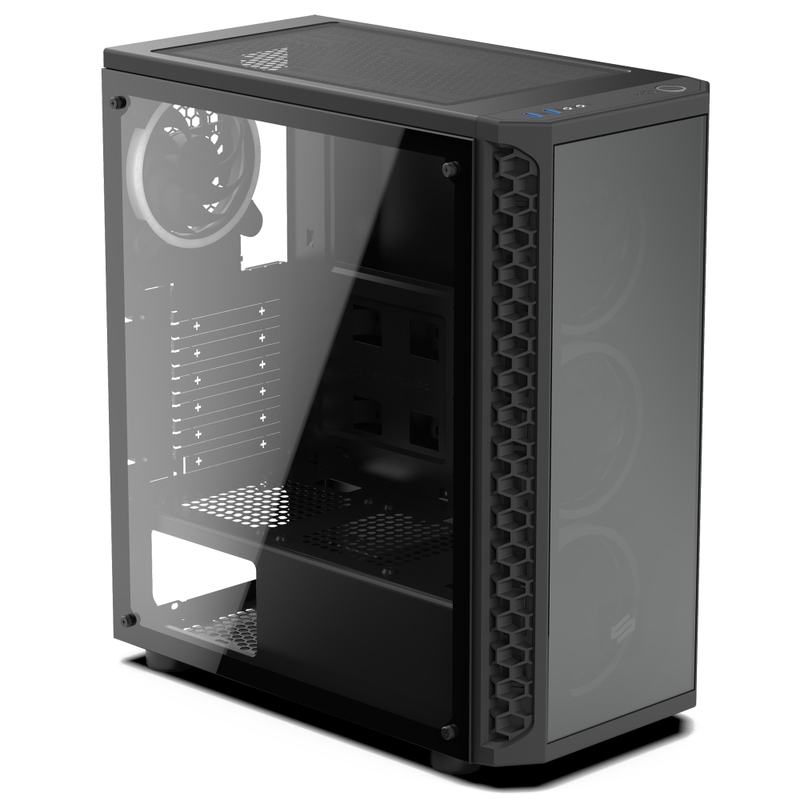 Modern construction of SilentiumPC Signum SG1X TG RGB case prioritizes airflow which enables very effective cooling of processor, graphics card and all the other components installed. 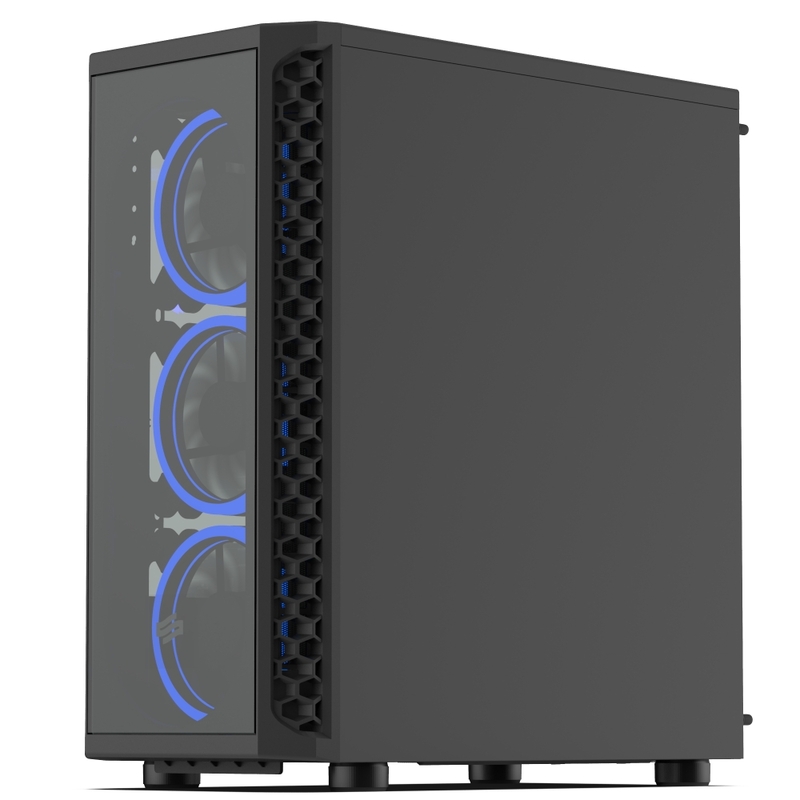 The out-of-the-box configuration consists of four Sigma HP Corona RGB 120 mm fans with users being able to make use of another four fan mounting points. 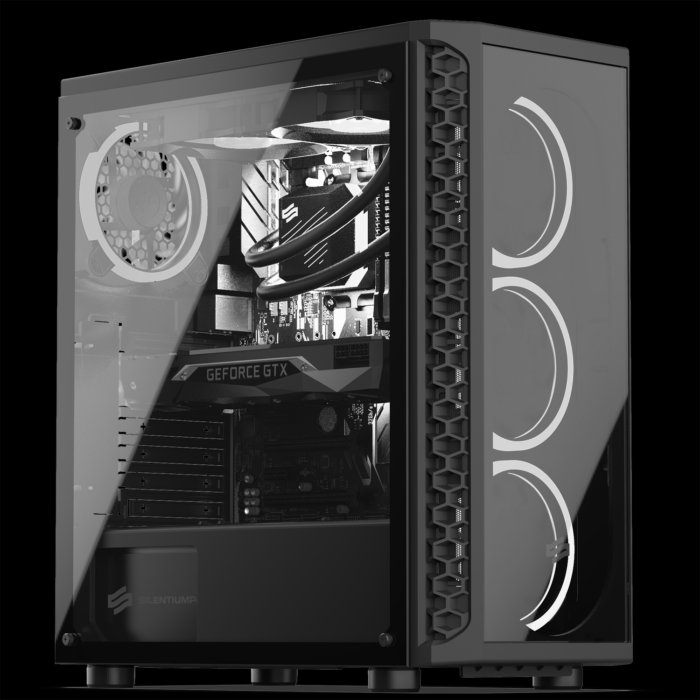 The hexagonal vents on both sides of the chassis are a part of the unique design characteristic for the Signum family. This kind of pattern of a front panel not only looks great, but it also provides an unobstructed access of the fresh air necessary for effective cooling of the components mounted inside. 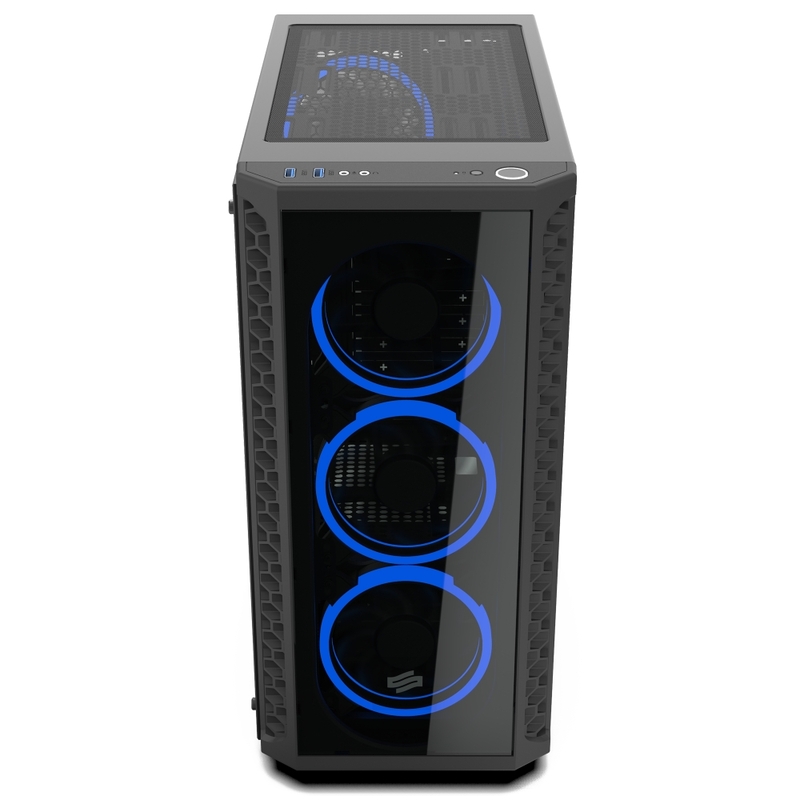 Four Sigma HP Corona RGB 120 mm fans included provide large amounts of airflow with three of them tastefully illuminating the glazed front as well. 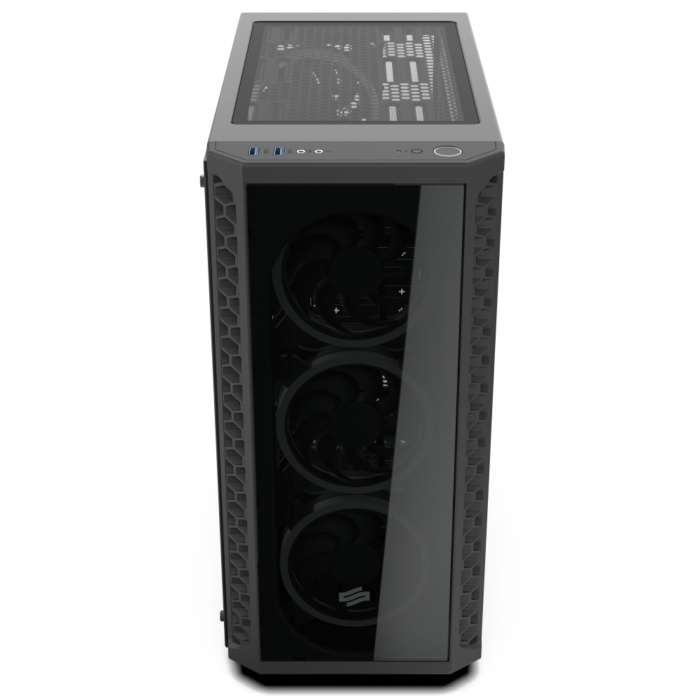 The fourth fan is located on the back. 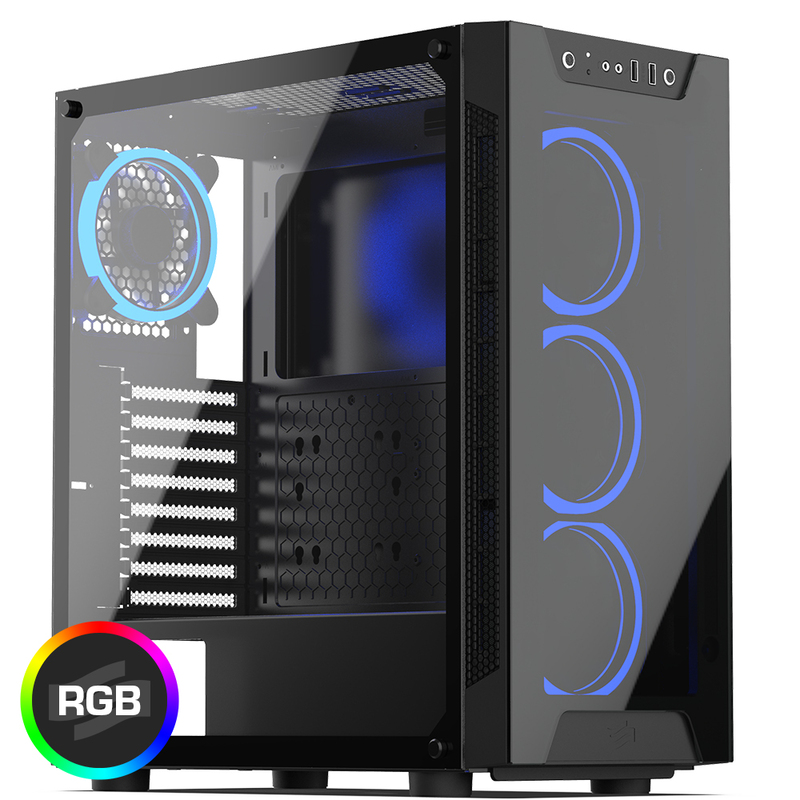 Signum SG1X TG RGB is equipped with four Sigma HP Corona RGB 120 mm fans, with built-in 18 RGB LEDs inside ring-shaped casing that enable the user to choose from any colour to create stunning lighting effects. 2× USB 3.1 Gen 1 (3.0) on top of the case, headphones and microphone ports and POWER/RESET buttons. 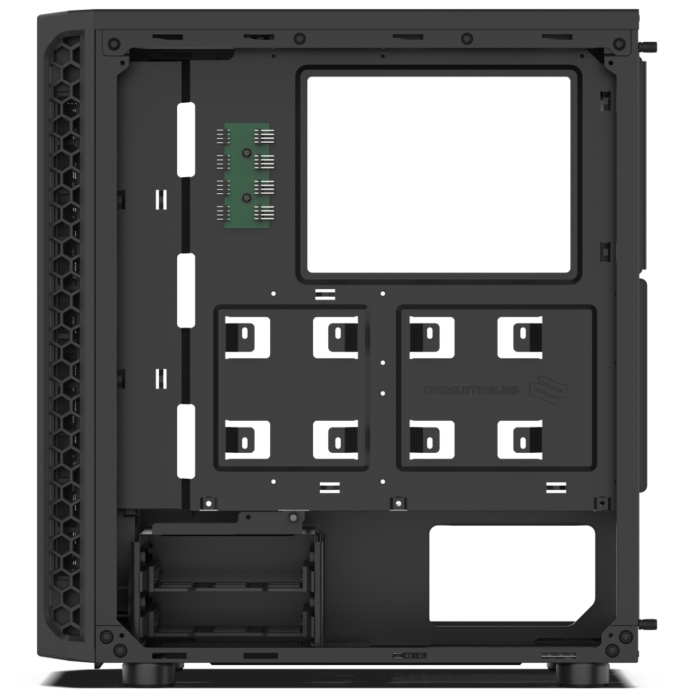 Such a location of the connectors not only provides the convenience of use, but also protects the plugged flash memory from accidental physical damage. 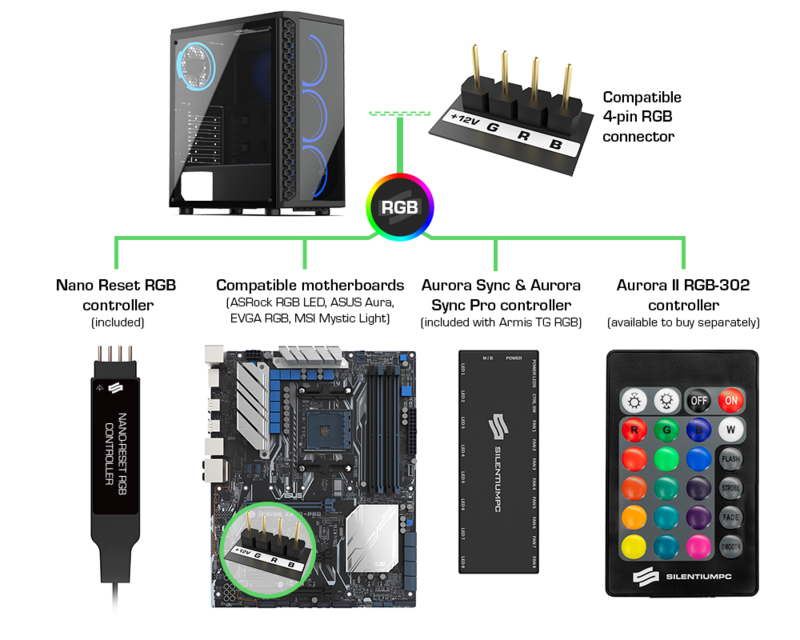 Included Nano Reset controller allows for controlling RGB devices in SG1X TG RGB case without a need for a compatible, 4-pin RGB motherboard. 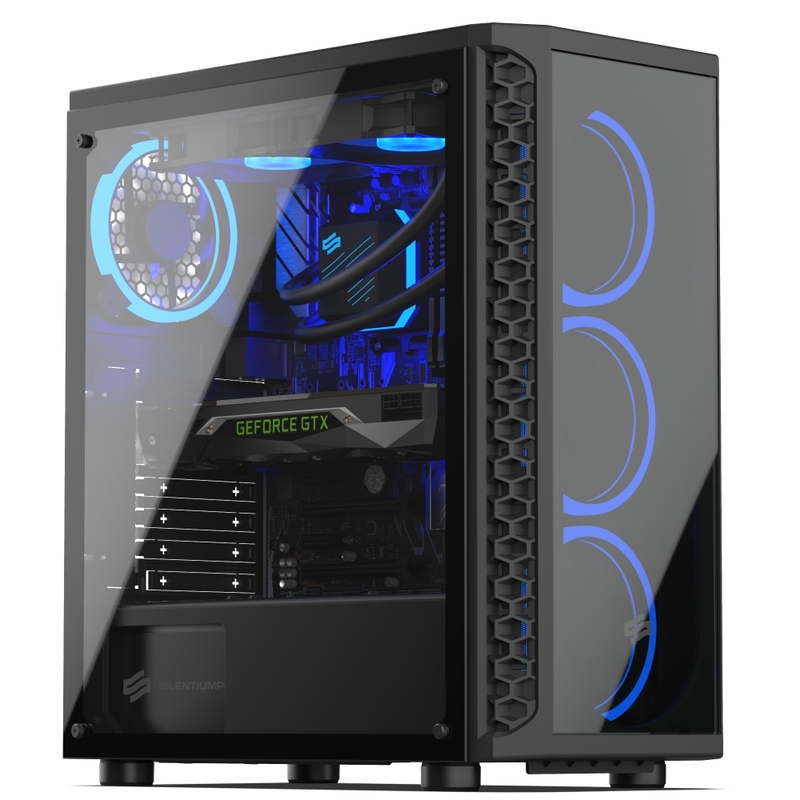 The device, when connected, overrides the function of a RESET button allowing for a quick change of RGB lighting color with a single press, and holding the button results in illumination turning off completely. 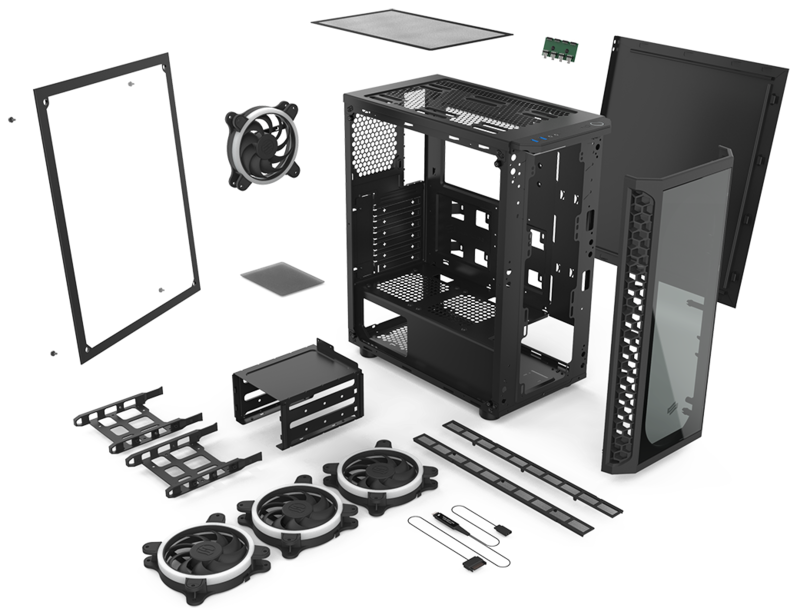 A second part of the set is a splitter for fans and RGB devices which sends both the fan steering signal (including PWM if available) from the motherboard and an RGB signal from the Nano Reset controller (or from the motherboard) into four Sigma HP Corona RGB fans connected. 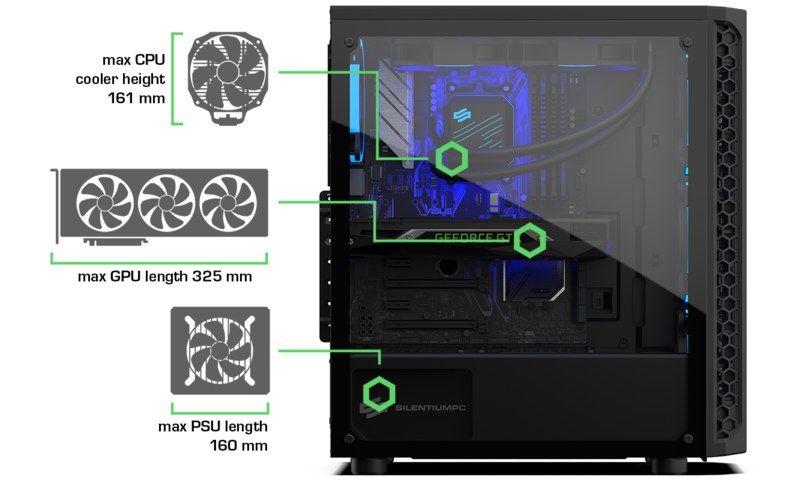 The interior of SilentiumPC Signum SG1X TG RGB chassis was split into two main areas (one for the PSU and the hard drives and the second one for the remaining components) thanks to which the elements that are normally located in the air movement path got isolated, what results in more efficient cooling of the computer’s parts. 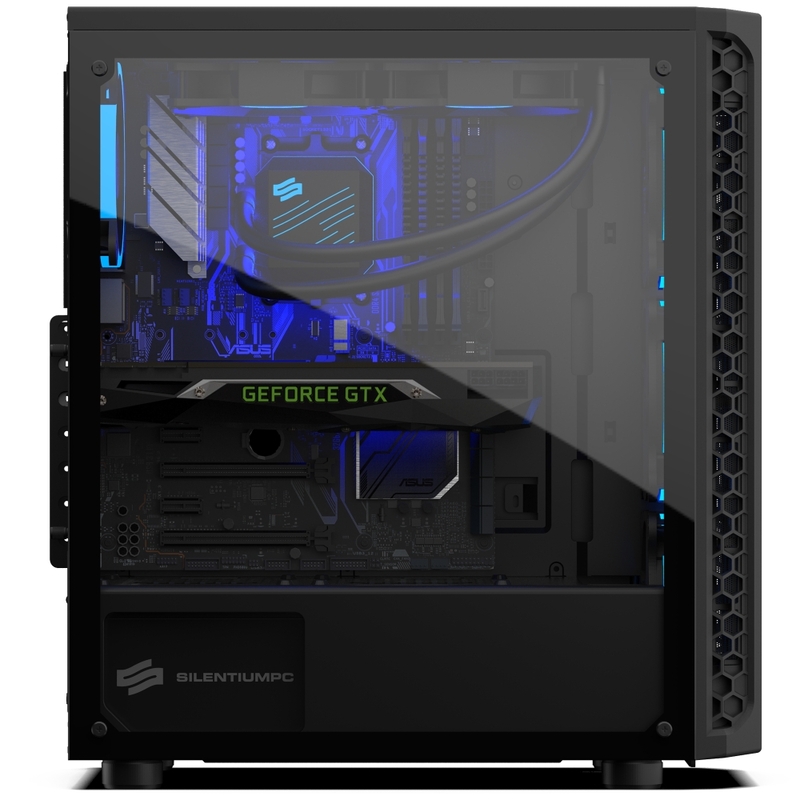 Signum SG1X TG RGB offers enough space for the integrated sets of liquid cooling (AIO LC). 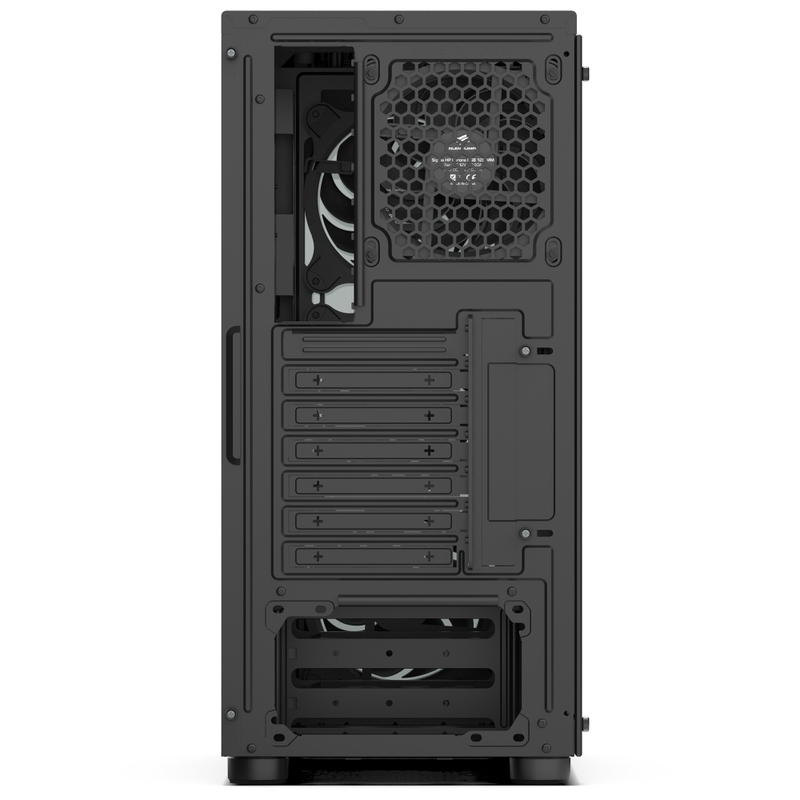 The 120/240/360 sized ones will fit on front, 120/240 on top and another 120 mm can be installed at the back of the case. In SilentiumPC Signum SG1X TG RGB case the four dust filters fitted as standard take care of its interiors cleanliness. 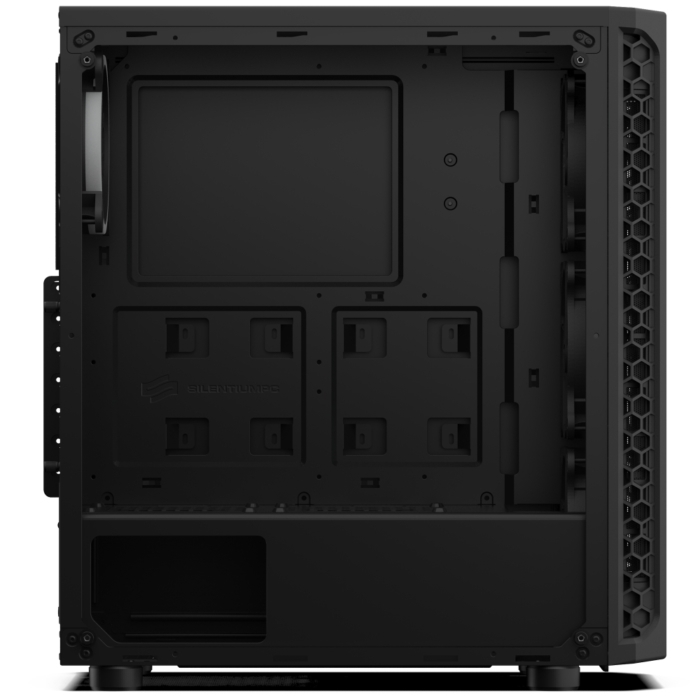 Two of them are mounted on front, another one under the PSU and finally, one on top of the chassis. Two 2,5" devices (e.g. 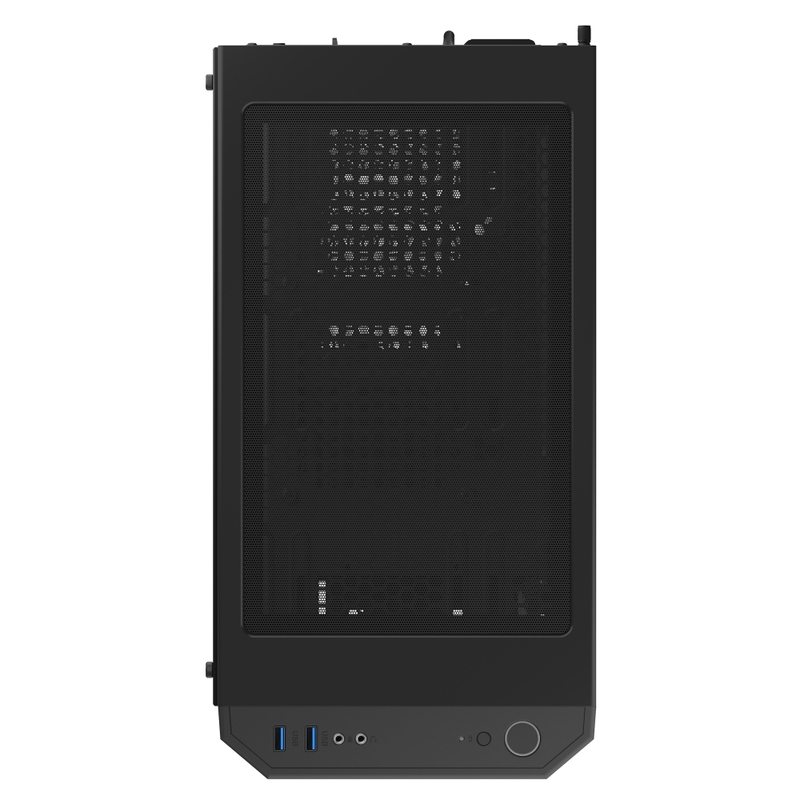 SSD drives) can be mounted in bays designed specifically for this purpose and located on the other side of the motherboard tray, in a service bay of the chassis. 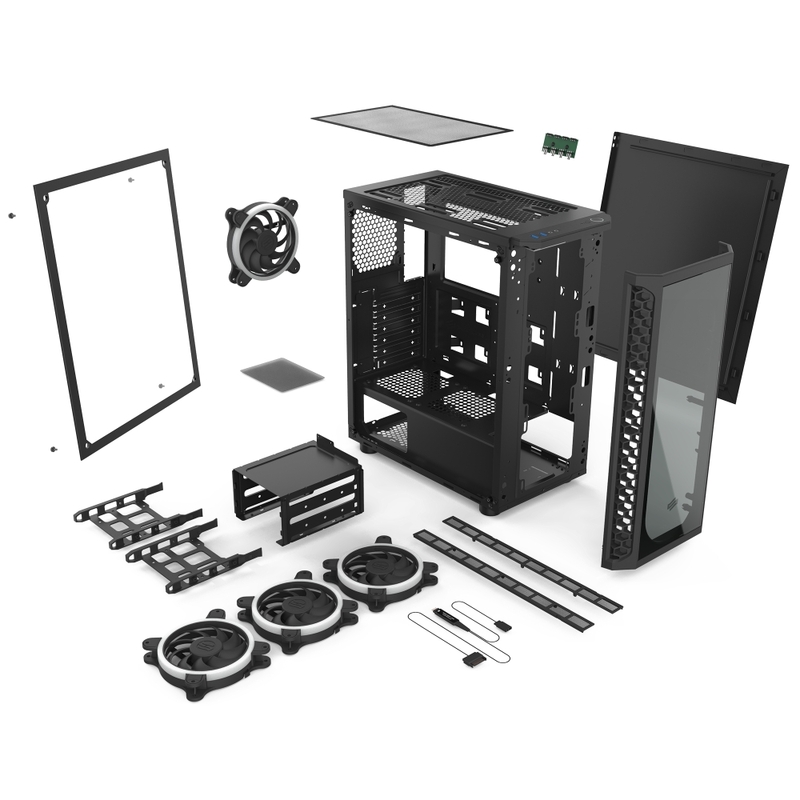 In order to access it, the user has to unscrew the side panel’s bolts and remove it. 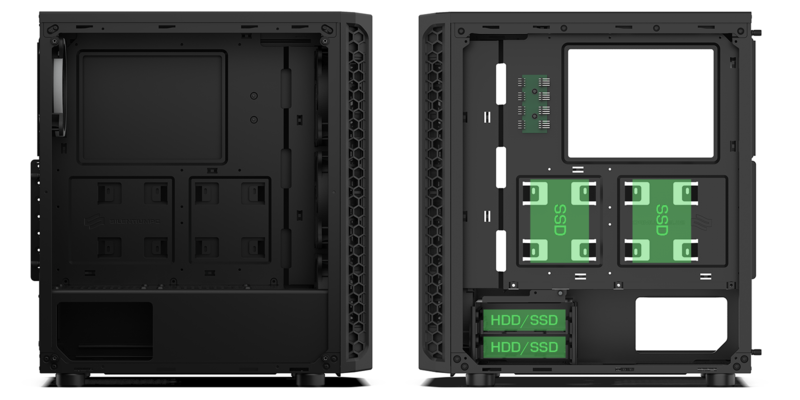 Such mounted SSDs do not take up space intended for the 3,5" hard drives. 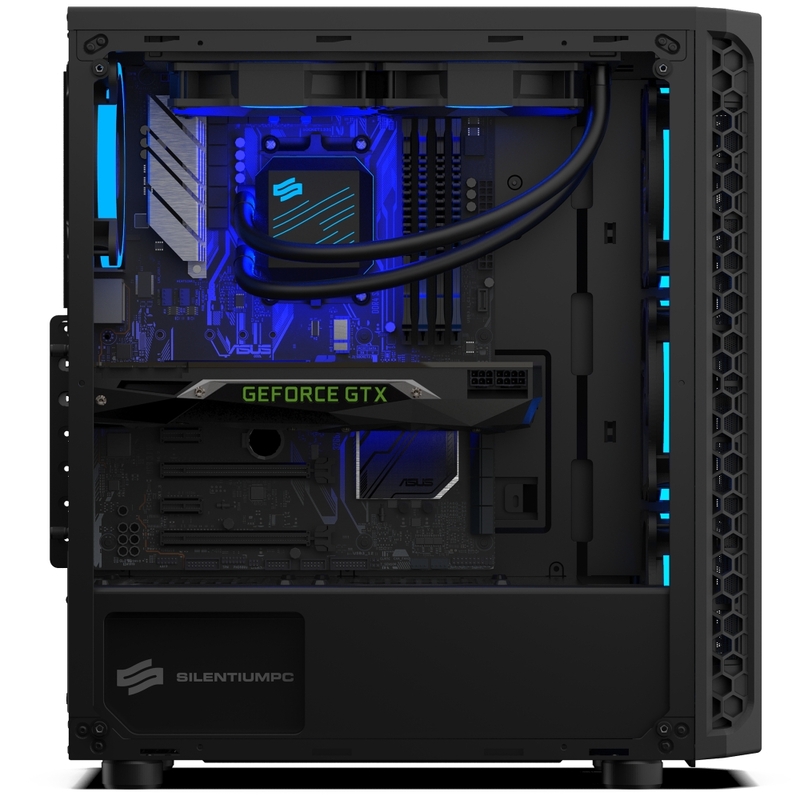 SilentiumPC Signum SG1X TG RGB is equipped with the cable arrangement system which consists of numerous cable entries, and a large amount of space behind the motherboard tray allows users to arrange the cables very precisely without interrupting the airflow that takes place inside of the case.